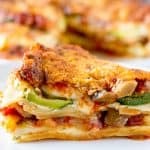 This Instant Pot veggie lasagna is loaded with fresh veggies, while still remaining true to the idea of real comfort food. Add ricotta, egg, basil, and 1/2 teaspoon of salt to small bowl. Whisk together and set aside. Using sauté setting… add oil, mushrooms, onions, 1/2 teaspoon of salt, and black pepper to pot. Cook for about 7 minutes, until all juices have released and evaporated. Add oregano and fennel seeds and cook for 1 minute. Then add garlic and vinegar and continue cooking for another 30 seconds or so. Add crushed tomatoes, 1/2 teaspoon of salt, and sugar. Mix well and let simmer for about 5 minutes. In a 7-inch pan… pour in about 1/2 cup of sauce, just enough to barely cover the bottom of pan. Add 3 or 4 noodles to pan to make an even layer (break them up if need be). I prefer to have them overlap because it helps the final product to hold its shape. Then spread half of the ricotta mixture over the noodles. Next, make an even layer using 1/3 of all your mozzarella. Make a slightly overlapping layer of squash, starting around the edges and working around the pan. Add about 1 1/2 cups of sauce, making sure to cover squash layer completely. Make another layer of noodles, followed by all the remaining ricotta mix. Repeat the previous steps as before with the mozzarella and zucchini (instead of squash). Make one last layer of sauce on top and cover pan with aluminum foil. Add 1 1/2 cups of water to pot, along with a 3-inch trivet. No need to rinse out the pot beforehand. Place pan on top of trivet, lock lid and cook for 40 minutes at high pressure. Once cook time is complete, quick-release pressure. Carefully remove pan from pot and uncover. Top pan with Parmesan cheese. Put pan on a baking sheet to prevent any splatters or leaks. Then place under a high broiler for about 5 minutes, or until cheese has reached the color/crispiness you prefer. Remove from oven and let rest for AT LEAST 30 minutes. If you slice or push it before it has cooled slightly, it will lose its shape and fall apart.